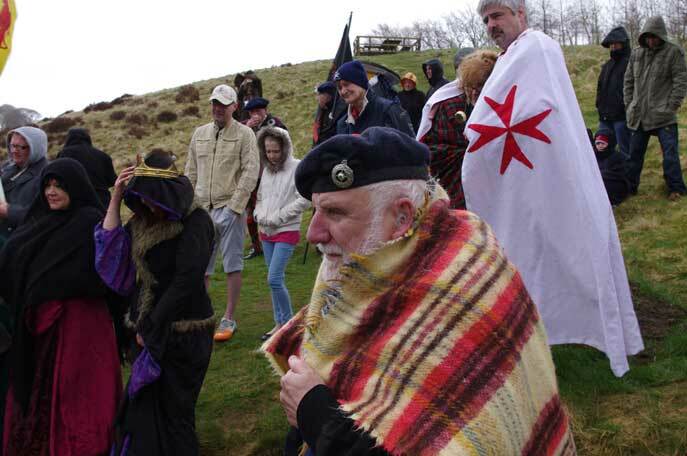 To all who attended & contributed to this years commemoration at Loudoun Hill, I’d like to take this opportunity to convey my heartfelt thanks. Sometimes, it’s not easy being a Scot. But we were there, no matter what the weather could throw at us. We are well used to a wee bit soft rain here, but what we endured was a deluge of biblical proportions. It came at us from all points of the compass, mostly horizontally. 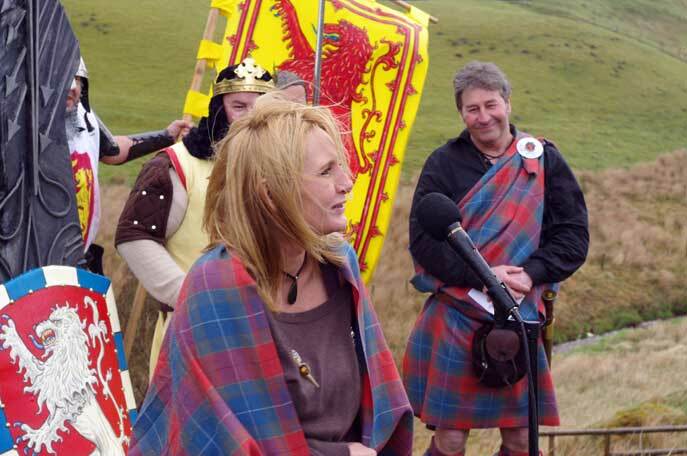 It was when it blew up from the valley, especially to the kilt-wearers, it caught the breath in mid-speech. However, we survived, as Scots do, & it is a tribute to our mettle that we took it in our stride, gritted our teeth & smiled through it. Having had to cut the ceremony short, & relocate to the Railway Inn, there we continued to laugh & dry out simultaneously. So I didn’t get the chance to thank our wreath-layers, speakers, poets, musicians, & all who made the day a special one, despite the weather. I do so now. It will be interesting to see the photos of the day, with folk trying to hold on to flags & hold their shed in place in the teeth of an Arctic gale! Well done all. A special thank you to William & Anne, who, for the last 3 years, have organised this commemoration. I know how much it all takes to put everything in place to ensure a successful day. 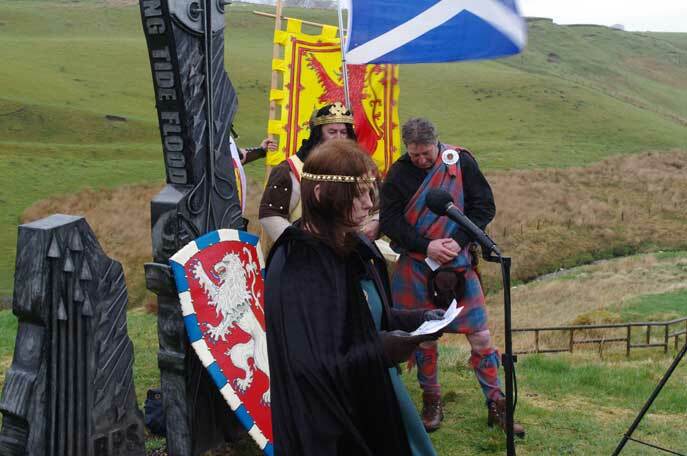 My enduring memory of the day will be our 2 speechifying virgins, as I referred to them, Tom Chalmers & Lesley Matthews, who held the crowd in the stinging rain, & not one person left to escape the torrent. When I introduced them, I was struggling to keep my teeth from going on their own (and they’re mine, honest), but Lesley, especially, caught the mood of the audience, stirring such a powerful feeling of emotion, just as the rain got heavier…and heavier. 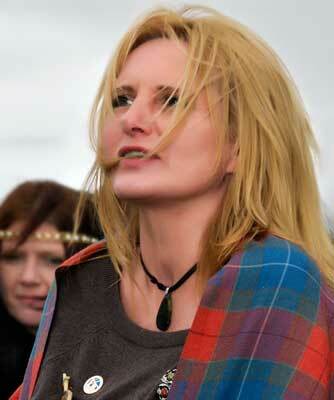 That embodied for me the spirit of the Scottish people, tough, resolute, unflinching. She just confirmed what I always suspected, she’s gonna be a great speaker. It was great to be amongst old friends again, from all over. Our friends, Gerald & Edna, who came up from Doncaster, Malcolm & Faither, Charlie & Catriona, all our friends from the Artizans & our FB friends Davy Tolmie & George Kempik. It was great to see you all. I enjoyed immensely the company of Geo, Brian & Gini, whose sense of humour would have had Big Davie in his element. Unfortunately, I had to leave just after Ted sung his heart out, but I hope that the rest of the evening with Donald & Charlie, Gordon & Kate, was just as good. Again, special thanks to William & Anne, who made the whole thing possible, from the original idea, to its conclusion. 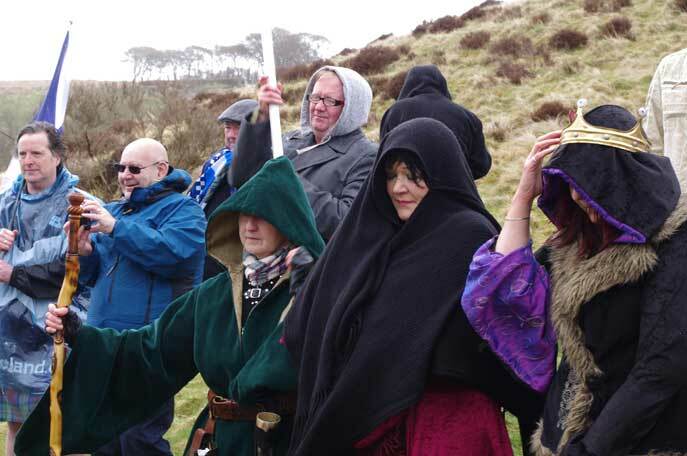 Well, Loudon Hill was a huge success despite the monsoon. 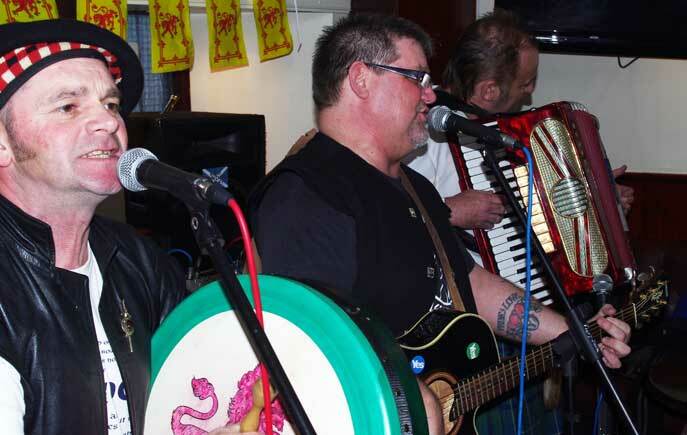 We stood in horizontal rain on the hill side to pay our respects to the fallen at the battles of Loudon Hill and then retired to the Railway Inn to enjoy good company, good food and wee dram or two all to the fantastic music of Ted (better than Elvis) Christopher and Fiery Jack. 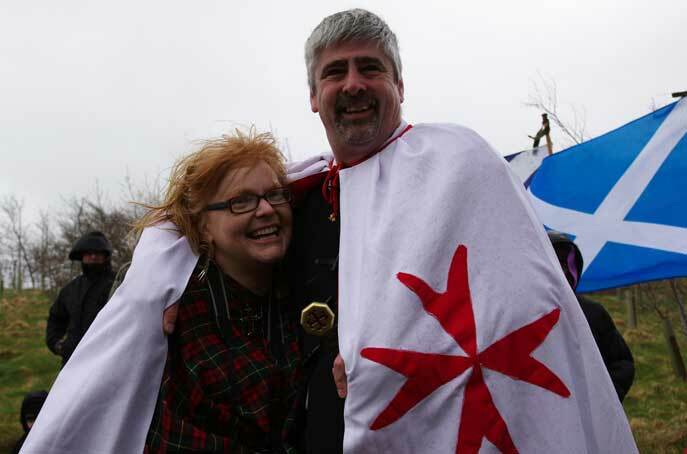 Big thank you to William and Anne for doing such a sterling job of organising everything - much appreciated and thank you to the usual suspects from the Society of William Wallace and Strathleven Artizans for your company and friendship. An especial thank you to all of you for your kind words of praise and encouragement following my speech - for a first timer it meant a lot and I have copied it here as requested. Thank you all again for a fab day and I'll see you all at the next event. There really is nothing I could tell you about Loudon Hill that you don’t already know. 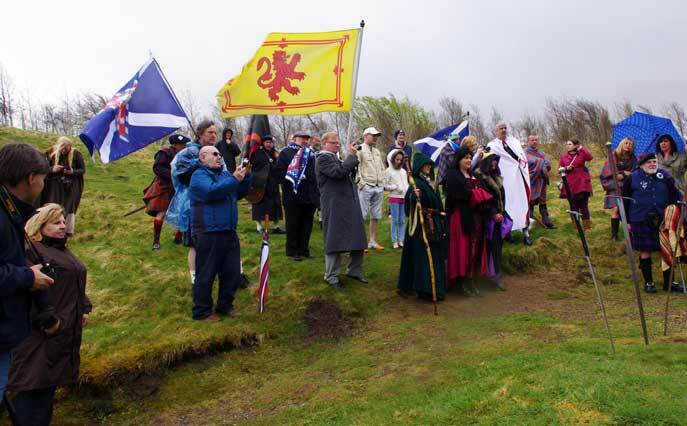 So instead, I’m going to tell you why Loudon Hill is important to me. This is one of my favourite places in Scotland and one I’ve returned to again and again, because I love the atmosphere here. When I’m down at the site of the battle, I can see them digging trenches in the road. I can hear them whispering to each other as they waited in ambush - such a tremendous atmosphere. It’s a great feeling to be able to connect to the past like that and a very pleasant way to spend your day. So I spend a lot of time visiting places like this that played an important part in Scotland’s history. I spend a hell of a lot of time reading about Scotland’s history and even more time talking about, thinking about Scotland’s history. 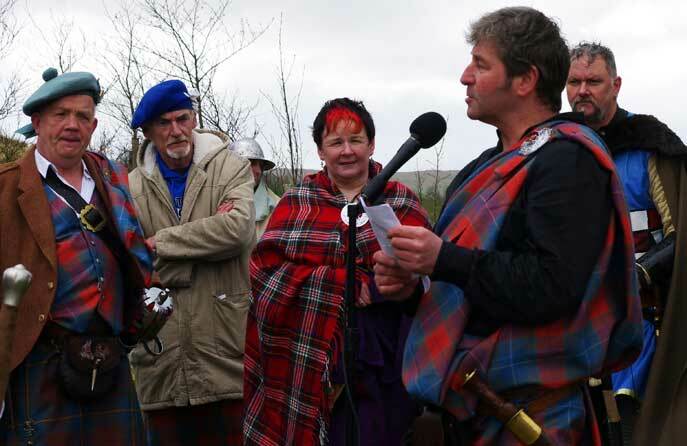 And someone said to me recently, “Why do you bother with all that - the books and the tartan? The past is irrelevant. It’s Scotland’s future that’s important”. And I disagree. You see, I’m no scholar, but I know what happened here at Loudon Hill. 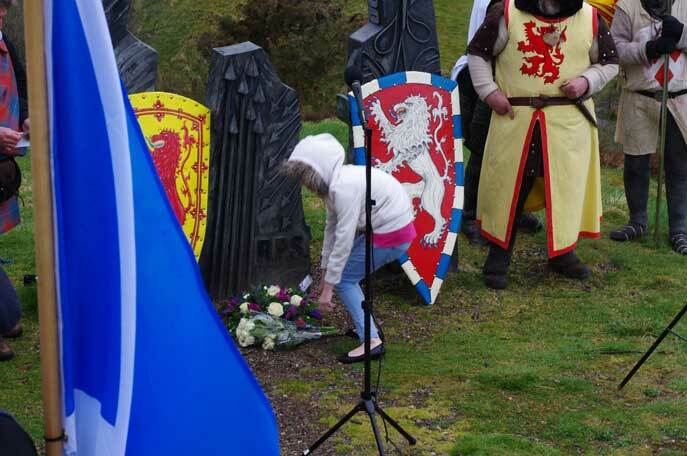 I know all about William Wallace, Robert the Bruce and Guid Sir James and what they endured, what they sacrificed, what they achieved for Scotland. I know about Bonnie Dundee and about The Great Montrose and the year of miracles. I know a hundred different stories about the Jacobite uprisings. I know about the enlightenment in Scotland and my country’s contribution to the world and a lot more besides, and because I know that, I know who I am. I know what a magnificent race I hail from. I have a national identity that is unshakeable. When I attend events like this and listen to William, Duncan, Charlie, my heart is thumping in my chest, patriotic pride bursting out of me. These are my people! This is my Country! I am a Scot! 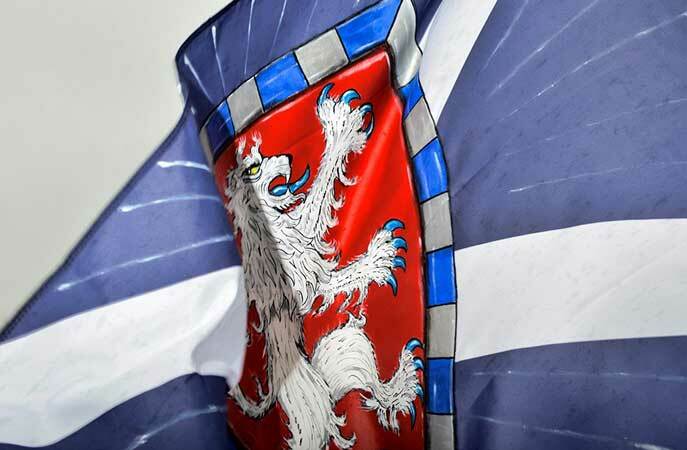 I wear my Scottishness like a suit of armour because no matter what the world throws at me, no matter how difficult the circumstances of my life may be – at the end of the day – I’m still Scottish and it doesn’t get better than that. Now that pride, that sense of identity is extremely important and I’m not the only one that knows it. They know it. Which is why for generations they have deliberately suppressed the stories of Loudon Hill, deliberately suppressed Scottish History, Scottish Pride, Scottish Identity. Because if every Scot in the land knew what we know and had the same sense of identity we have – the referendum would be a forgone conclusion. But unfortunately that isn’t the case. They have tried to replace our glorious identity with “You’re a tartan fool. You’re too wee to be free. You don’t have what it takes to make it on your own. You need England backing you up, supporting you, better together”. Now they may be liars, but they’re no daft and it’s working. Because not only are Scots putting up with that, some Scots are actually agreeing with them. That’s madness. Incomprehensible to me and we need to do something about it. 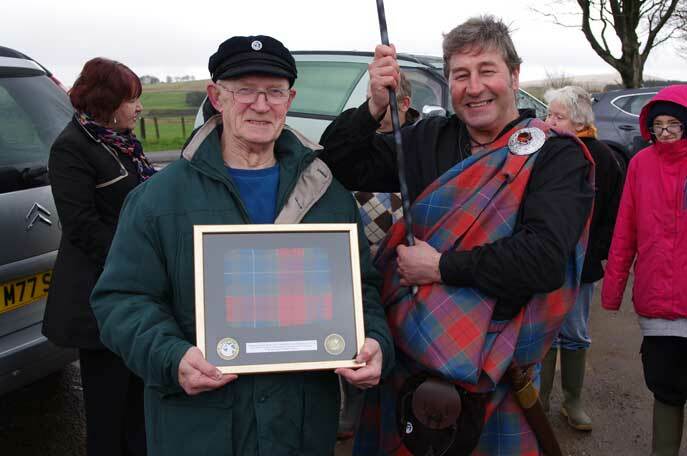 Now the other reason that Loudon Hill is important to me is, I can’t read the stories of what happened here without a big smile on my face, especially the way Davie tells them. What we had here was an invading foreign army of arrogant arses that came swanning through here like they owned the place. 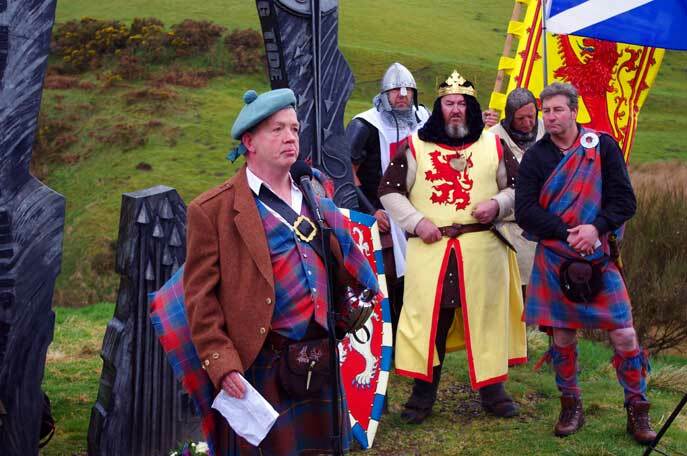 But – General Fenwick was met by William Wallace and Aymer de Valance was met by Robert the Bruce, and William Wallace and Robert the Bruce leathered the life out of them. Now the reason they two were so successful, despite all odds, was because they used their heids as well as their hands, used brains as well as brawn and that’s what we have to do. We need to fight as hard today as they did then because we are at war and it’s a war against ignorance and lies. There’s no use sitting on your arse with your fingers crossed for 2014. We need to rise now and be a Nation again. 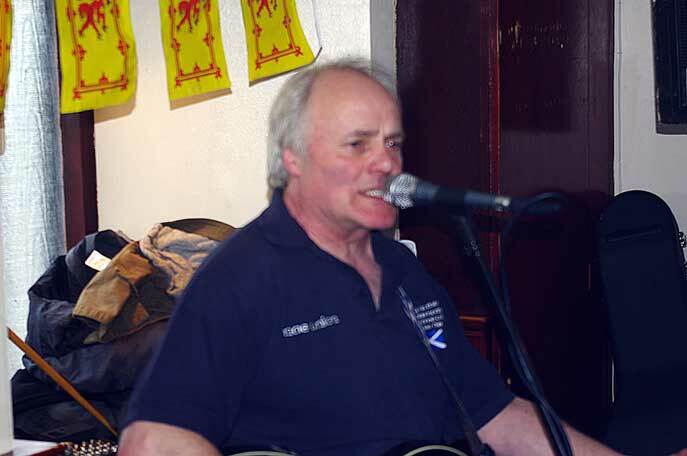 We need to talk to the folk down the pub, talk to the folk in our work, talk to our neighbours. Tell them the truth about Scotland’s history. Tell them the truth about Scotland’s future. 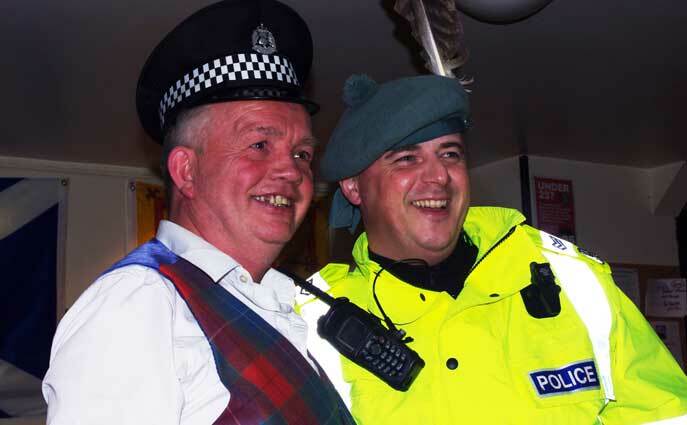 We need to help our fellow Scots re-discover their national identity which is their God given birthright. Because only then will we win and only then will we be able to take our rightful place in Scotland’s history and say “We did it!”, “We finished what they started. Thanks to us, thanks to me, Scotland is a free Nation again”. So aye, Loudon Hill is important to me. 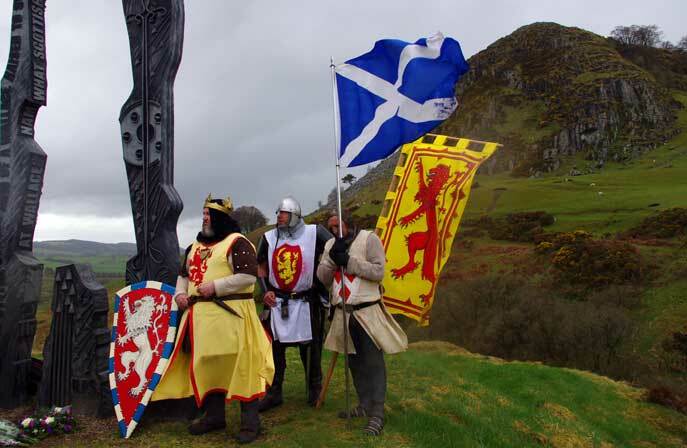 Robert the Bruce is important to me and William Wallace is important to me, but I’m not voting yes for them. I’m voting yes for my two girls, Daryl and April and for my nieces Jodie, Olivia and Alicia and their children and their children’s children, because what’s at stake here is Scotland’s future - their future, and I will fight with every last breath in my body to make sure they inherit from me a free country, because aye, that is what’s important. 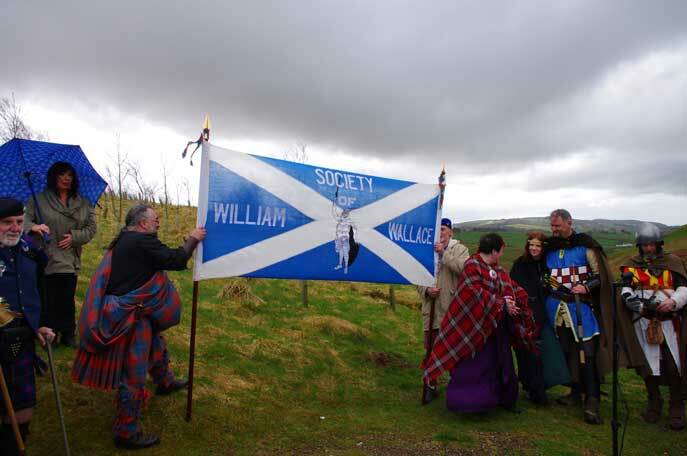 But I will also make damn sure they know who they are, where they come from and what it really means to be a Scot.